Geniune Factory Original Filter Upgrade Kit for Aprilaire / Space-Gard Model 2200 Air Cleaner. Fits all Model 2200 air cleaners produced after 1985 with old or new style doors. ALSO say goodbye to messy filter assembly, and pleat spacers. The new MERV 13 media simply slides into your existing air cleaner. 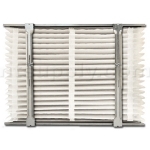 This kit provides a permanent upgrade to more efficient filter that you can change yourself!
. Door spacer - easily inserts into back of door insuring tight seal and eliminating air bypass (for 2200 units with "old style" door - the spacer is not needed).